Admiral Craig Faller announces an unprecedented joint military operation with Brazil to the US Senate Armed Services Committee. What does it mean for national sovereignty? Brazil’s participation in US SOUTHCOM is part of a broader process that began with the coup of 2016. The aggression against our sovereignty is much more serious than we imagined. The reasons for this are as follows. The projection of a country’s interests in the complex and competitive World scenario essentially occurs in two forms: foreign policy and defense policy. Therefore, while the full projection of Brazil’s strategic interests in the international scenario depends on a consistent foreign policy, it has to be linked with a sound defense policy. Undoubtedly, diplomatic persuasion should be the principal means of asserting national interests, especially those of peaceful nations such as Brazil. However, it must be acknowledged that such persuasion works most effectively when complemented by strategic deterrence. A country of Brazil’s geographic, demographic and economic dimensions can not do without an efficient defense policy. Even in the context of a peaceful region such as South America, Brazil, with its abundant strategic resources (fresh water, biodiversity, land, pre-salt petroleum reserves, etc.) and its recent international geopolitical projection, arouses jealousies and rivalries which must be neutralized. Foreign policy and defense policy are complementary policies. Both project the kind of country it wants to be on the world stage. But what type of nation to these policies project today? Since the 2016 coup, both the foreign policy and the defense policy that have been outlined, which are now consolidating and deepening with Bolsonaro, project a smaller, fragile country which submits itself to the US’ orbit of geopolitical and geostrategic interests. Essentially, we are being transformed into a giant Puerto Rico. The setbacks in foreign policy have become quite clear. While anxiously seeking uncritical alignment with the United States and its allies such as Israel, all previous successful strands of foreign policy that dramatically increased our international prominence, such as that of Mercosur and regional integration, South-South cooperation, integration with BRICS, strategic partnerships with emerging countries, investment in Arab and African countries, emphasis on multilateralism and the generation of a multi-polar world, etc, have gone out the window. But these setbacks are also happening in defense policy in a somewhat more discreet and less noticeable manner. They have been underway since the coup in 2016, but now they have acquired greater speed and depth with a new government that openly salutes the United States. In the PT governments, an attempt was made to articulate and “active and haughty” foreign policy, which projected an independent and strong country onto the world stage, with a consistent defense policy that aimed to create full strategic deterrence and actively contribute to Brazil’s economic and technological development. Thus, in 2005, the new National Defense Policy (PDN) was launched, which gave special emphasis to training in the production of materials and equipment with high added value in technology, with a view to reducing the country’s external dependence in this strategic area. In addition, a number of strategic projects such as the nuclear submarine and the new fighter jets were created or strengthened to promote strategic deterrence in all scenarios. In turn, the National Defense Strategy (NDT), launched in 2008, established the “revitalization of the defense material industry” as one of the three pillars for national defense, alongside the reorganization of the Armed Forces and its composition policy. In this way, the Strategy affirmed the inseparable link between defense and development. The BITD (Industrial Defense Base) came to be seen as a driver of technological innovations, with civil applications. It also stimulated independent technological development, especially in the nuclear, cybernetic and space sectors. The National Defense Policy and the National Defense Strategy complemented the independent foreign policy of that time, both with regard to obtaining adequate armaments and promoting strategic deterrence, as well as stimulating autonomous economic and technological development. Foreign policy and defense policy therefore pointed to the same direction: the construction of an independent nation with its own geopolitical and geostrategic interests. Now, the defense policy, in tandem with the Bolsonaro’s poor foreign policy clearly illustrates the country’s weakening and deepening of its economic, political and technological dependence. The first major blow against the previous defense policy was struck in 2016. Constitutional Amendment No. 95 of 2016, which froze primary expenditures for a long period of 20 years, meant an inevitable economic constraint on the pursuit of strategic deterrence and the development of a significant industrial defense base. In all projected simulations, defense investments are expected to suffer brutal contractions, since the new mandatory constitutional expenses are expected to increase substantially in the coming years due to population growth. Even assuming that defense spending does not suffer a nominal contraction during this period, a highly improbable hypothesis, its mere freezing will imply (assuming that Brazil returns to a 2.5% annual growth rate) a substantial decrease in spending as a percentage of GDP. Even with this average growth rate it will fall from 1.4% of the GDP in 2014 to 0.85% of the GDP in 2036. In addition to the damage that Constitutional Amendment No. 95 of 2016 will inevitably cause to the National Defense Strategy, it is also necessary to analyze how the Lava Jato investigation has caused considerable losses to the Industrial Defense Base. In fact, all the companies that have been paralyzed and fragilized by Lava Jato play a crucial role in this Strategy and in the Industrial Base, since the companies investigated are strongly present in all of the major projects in the area. We have no doubt that the combination of Lava Jato, which is weakening the business arm of the National Defense Strategy, with Constitutional Amendment No. 95, of 2016, which will drastically reduce state investment in this area, could make Brazil return to its role in the 90s, when the emphasis given by neoliberalism was on the country’s disarmament. In addition to these economic factors, it is important to mention that the US Army participated, at the invitation of the Brazilian government, in a joint military exercise in November 2017 on the triple Amazon border between Brazil, Peru and Colombia. This fact reveals a troubling political decision for national sovereignty, in the field of defense and the defense industry. It was one of the most unprecedented and bizarre decisions in Brazil’s recent military history. Before the coup, our country had been investing in the sovereign management of the Amazon in partnerships with South American countries that were established in regional cooperation mechanisms, particularly those of UNASUR and those of the Amazon Cooperation Treaty Organization (ACTO). Thus, this invitation to a foreign superpower which is not part of the Amazon Basin, represented a point outside the curve, in relation to national sovereignty in one of Brazil’s most strategic regions. These exercises have come in the wake of a series of bilateral initiatives that are part of a post-coup government strategy for subaltern re-approximation with the United States, in both foreign policy and in defense policy. Within this framework, the Brazilian Ministry of Defense and the US Department of Defense signed the Master Information Exchange Agreement for Research and Development (MIEA). With this decision, post-coup governments will now invest in cooperation with the US as a way of “developing” our defense industry. In practice, this means giving up real autonomy in the fields of industrial and technological development for national defense. Apparently, sectors of the Armed Forces have renounced the relatively autonomous technological development provided for in the National Defense Strategy, and are now mistakenly betting on a restructured relationship of dependency with the US. One sign of this is the new renegotiation of the notorious Alcântara Agreement, which would impede the development of our satellite launching program and replace it with an American military base, establishing a new dependancy on the US. Boeing’s purchase of Embraer, in light of the dual civilian and military use of aeronautical technology, will also jeopardize important military projects, as well as prevent autonomous technological development in a sensitive and strategic field. All of these setbacks which began in 2016, are now clearly deepening with the Bolsonaro government. The offer for building a US military base on Brazilian territory, announced by Bolsonaro himself, though temporarily denied by Vice President General Hamilton Mourão, would equate us with countries like Honduras, which has transformed into a mere US satellite. Brazil’s participation in the bellicose and dangerous US plan to destabilize the Venezuelan government is another indicator of a subservience that directly opposes the interests of our country in the region, which would be much better served by a negotiation strategy that preserves regional integration and peace on the continent. Now a new announcement has buried the hopes of everyone who was still betting on the preservation of Brazilian sovereignty. 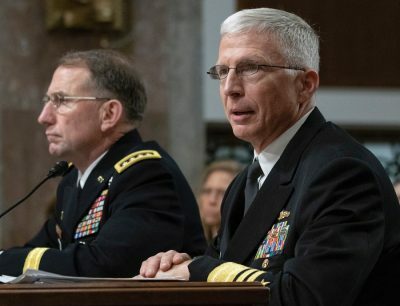 On February 7, Admiral Craig Faller, head of the United States Southern Command (SOUTHCOM), announced to the US Senate Armed Services Committee that Brazil will participate in its SPMAGTF (Special Purpose Marine Air-Ground Task Force) and will lead the multinational naval exercise UNITAS AMPHIB. This means that our country will actively and directly engage in US-led military operations. That is, Brazil will voluntarily place itself in a position of military subordination to US actions in our region. In addition, Admiral Faller also announced that Brazil will send a general to serve as Deputy Commander for SOUTHCOM. These are very grave announcements. The United States is strongly committed to fighting the influence of China and Russia in our region and identifies countries as Venezuela, Nicaragua and Cuba as allies of these “enemies”, who must be fought hard. Therefore, SOUTHCOM will be used offensively in Latin America to meet this North American geopolitical goal. It is not a question, as the panglossians may imagine, of mere training exercises for humanitarian purposes, but also of military actions aimed at destabilizing regional governments and establishing dependency ties with the armed forces of allied countries. The US will not aim to put its boots on the ground in these operations, but will encourage the involvement of troops from countries like Brazil and Colombia. They want us to do the dirty work. There is also a clear goal of ensuring privileged access to our region’s strategic natural resources. It does not appear to be a mere coincidence that the US Fourth Fleet was reestablished after 58 years, precisely in 2008, shortly after Brazil announced the discovery of the pre-salt offshore petroleum deposits, which transformed it into the nation with the world’s 3rd largest petroleum reserves. The fact is that ever since Brazil established the South Atlantic Peace and Cooperation Zone (ZOPACAS), through UN Resolution 41/11 of October 27, 1986, the United States has been trying to oppose Brazil’s projection into the Atlantic. Therefore in 2008, the same year they recreated the Fourth Fleet, the US also created the African Command (USAFRICOM), with the clear intention of opposing the projection of Sino-Brazilian interests into that continent. In 2010, both the Pentagon and NATO pressured the Brazilian government to support the extension of NATO’s jurisdiction into the South Atlantic. However, the government of that time vigorously voiced Brazilian opposition to the US and NATO. Defense Minister Nélson Jobim said he considered the “security issues of the two halves of the ocean” to be distinct, and that after the Cold War, NATO had “become an instrument of its exponential member, the US, and of the European allies”. Those were good times. Now, with this embarrassing decision, Brazil loses its own geostrategic projection into the South Atlantic and the Blue Amazon, where the pre-salt is located. Note that a few years ago the US Navy began conducting multinational exercises with NATO and African member countries to patrol maneuvers in the Gulf of Guinea where the African pre-salt reserves are located. All of these measures and actions converge into one scenario: the economic and institutional bases of our Defense Policy and National Defense Strategy are being undermined, and political decisions are being made that place our armed forces as subordinate, US proxies. These political decisions on defense, coupled with a foreign policy of geopolitical subordination to the United States, which pleases the former army captain who saluted John Bolton and his Nights Templar-obsessed Foreign Chancellor is transforming us into an unfortunate dog of the US Empire. The destruction of the Industrial Defense Base and the economic constraints on investments in National Defense, which will be aggravated by the focus on ultra-liberalism, will lead to disarmament, weakening of major strategic projects, technological dependence and the absorption of obsolete US military equipment. As this happens, we will not just be a dog. We will be a toothless mutt, barking at the our master’s enemies. The South Atlantic will now be dominated by NATO.